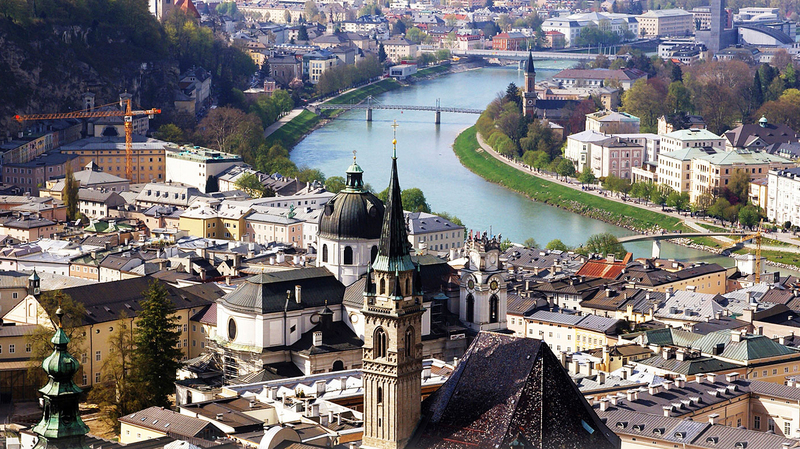 Search for the best flight prices from Manchester to Salzburg. Compare prices, book today and save money with Manchester Airport. Where stunning Baroque churches are nestled before a backdrop of snow-covered peaks. Nothing beats it for a touch of historical magic, with evidence of its imperial past in a huge variety of proud palatial architecture. There’s plenty of skiing, eating and drinking to be done – and even coffee drinking has been elevated to the highest form of art. The best hotels in Salzburg huddle in its historic core, but converted castles and rustic farmhouse pensions also hide in the surrounding hills. The celebrated Hotel Goldener Hirsch (Getreidegasse 37) has been an inn for 600 years and channels old Austrian charm like nowhere else. Good mid-range options also in the Old Town include style-conscious Arthotel Blaue Gans (Getreidegasse 41-43) and the historic Elefant (Sigmund-Haffner-Gasse 4), which has hosted everyone from the real Maria von Trapp to Maximilian II. Alternatively, splurge on a period room in a medieval castle such as Haunsperg (Hammerstrasse 51, Oberalm), 15km south of Salzburg. The cobbled alleyways of Salzburg’s Old Town shelter a treasure trove of traditional shops, craft workshops and little boutiques. The best-known shopping streets are Getreidegasse and Judengasse, but check the little passageways and courtyards too. Highlights include chocolate shop Holzermayr (Alter Markt 7), St Peter's bakery (Kapitelplatz 8) and centuries-old leather workshop Schliesselberger (Lederergasse 5). In contrast, the glitzy Europark shopping centre (Europastraße 1) has all the big brands and more. For fresh produce and traditional Austrian spice bouquets, try the Green Market (University Square), open Monday to Saturday. Salzburg has some of Austria’s grandest restaurants, serving some of its most traditional food. Many are in historic buildings with stone pillars, panelling, vaulted ceilings and chandeliers aplenty. One such is the venerable Stiftkeller St Peter (St Peter Bezirk 1/4), arguably Europe’s oldest restaurant at 1,200 years. In contrast, Magazin (Augustinergasse 13) led a new wave of neue Küche (nouvelle cuisine) restaurants, with stylish décor and mid-range prices. Austria’s biggest beer cellar, Augustiner Bräu (Augustinergasse 4), offers simple fare or allows guests to bring their own food to accompany the beer. Or for a quick pick-me-up, 300-year old Café Tomaselli (Alter Markt 9) has local legends, baked goodies and famous coffees to spare. Warm-up act to the big summer extravaganza, the Salzburg Easter Festival is also a respected opera and classical music festival in its own right. What better way to see Salzburg than to pant and sweat your way around 42km of it? Well, we can think of plenty, but thousands willingly run the city marathon through beautiful palaces, squares and gardens each year. Top of the cultural agenda, this world-renowned programme of opera, theatre and classical music lasts for a full five weeks, and is staged in venues across Salzburg. It finishes in true Austrian style with a ball. The perfect antidote to the highbrow Salzburg Festival, SommerSzene is an avant-garde performing arts festival that showcases edgier contemporary dance, theatre, music and film. In the festive season, an explosion of fairy lights, candy canes, snow globes and crafts decorates the Domplatz. The sounds of carol singers and smells of mulled wine fill the air, and announce that the Salzburg Christmas Market is in business.